This morning I had breakfast in the Compass Rose with a wonderful choice of everything you could think of for breakfast - beautifully presented with impeccable service. This is a sea day and there is a huge array of activities to choose from, or if you prefer you could just relax! We started at 10 am with a Ballroom Class in the Observation Lounge, hosted by ballroom champions Hannah and Sasha from last night’s show. Other activities today include various seminars, a presentation from Ian McCormack on "The World of Faberge", classes with the fitness director, an Enrichment Lecture by Terry Bishop, Wine Tasting, a top toss tournament and an Art seminar - and all of this before the Captains noon update from the bridge! In the afternoon there was a similar programme with the addition of live music, needlepoint and Afternoon "Cheesecake tea". 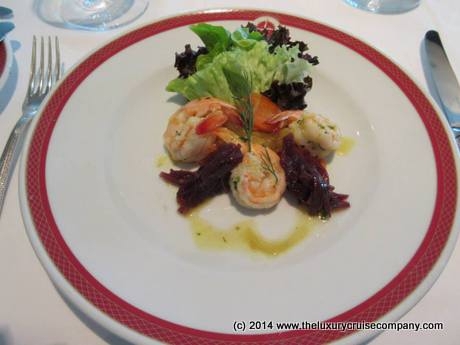 Lunch was a fabulous meal - I had a Tiger Prawn Starter followed by Lamb with a Feta Crust. I went to a Baggo competition before Cheesecake Tea followed by a very well attended quiz. My team came first yesterday and 2nd today! At 6pm there was a rare announcement saying we were having a "block party". We were told to grab a wine glass from our suite and go into the corridor to meet our neighbours! My wine glass was filled as soon as I got into the corridor and I met my very interesting neighbours. The Captain and JR the cruise director came along and shook our hands. I thought this was a lovely touch which I enjoyed. I just had time to redeem my Regent points before we had a pre-dinner drink in Horizon Bar. For our last dinner we went to Compass Rose and again it was a wonderful meal. I started with prawn risotto, followed by a tomato, beef and onion soup. My entre was from the Prime 7 menu - succulent Lobster salad with a chocolate soufflé to finish. Tomorrow morning sadly it’s time to fly home from my final port Copenhagen. I was very impressed with Seven Seas Voyager, she exceeded my expectations. Somehow I thought the average age would be much higher, and, due to the fact that Regent have such a high percentage of repeat bookings, I thought the other passengers may not be that friendly, I was very wrong. Even though I knew the tonnage and size of the ship I was surprised to see how much space there is everywhere. The staff were perfect with their service, everything you need without being intrusive. All of this, plus the all-inclusiveness, made the "Regent difference" clear to me. The Seven Seas Voyager is 42,363 tons and takes about 700 passengers, there are 9 passenger decks. All-suite Seven Seas Voyager provides fine food and excellent service, and with even the smallest suite at an impressive 300sq ft, you have a wonderful relaxing retreat of your own. Regent Seven Seas provide a very high level of attentive service - this is due to a high staff to passenger ratio with around 1 staff per passenger. Dress code is elegant casual. Many of my fellow passengers told me that Regent Seven Seas standard was always consistent, which is good to know. The ship was very spacious with a nice choice of lounges and bars and in the evening there was always an excellent show - after which it was possible to listen or dance to live music to quite late into the night. For dining there is one open sitting but you do need to reserve the speciality restaurants. Dining venues include: Compass Rose, Prime 7, Signatures, Pool Grill, Coffee Connections, La Veranda and Sette Mari. 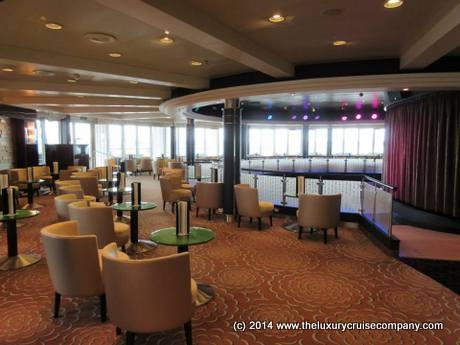 Lounges include: Horizon Lounge, Observation Lounge, Connoisseur Club, Voyager Lounge. Entertainment and other venues include: Constellation Theatre, Casino, Night Club, Internet Café, Library, Boutique, Gym, Beauty Salon, Aerobic Studio. Card Room, self-service laundry rooms (x5) & Reception. The average age on board is, I would say, 60-65 years old. I spoke to a few first time cruisers who thought the ship was wonderful! This cruise line is a very good choice for well-travelled couples who like a very high standard. 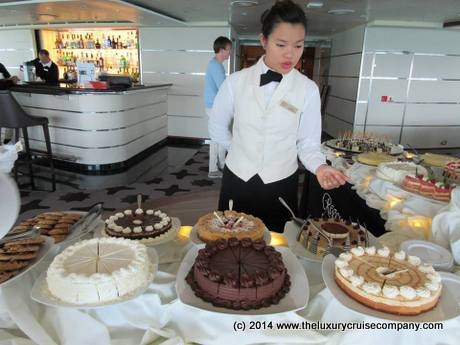 The itineraries are port intensive and they include many smaller ports and overnight visits. I recommend that you experience the Regent difference I cannot wait to cruise with Regent again. 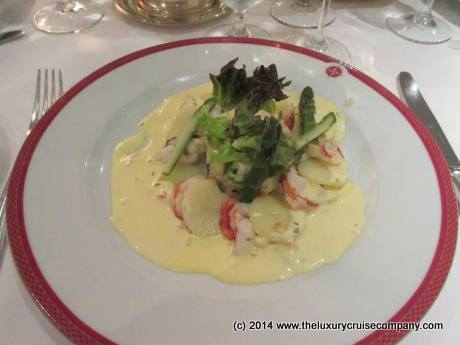 For more information about Regent Seven Seas Cruises please see our dedicated page - Regent Seven Seas Cruises.